Our entire reality depends on how our senses receive it. With this simple concept which stands to the reason, if we present your senses with made up information your perception of reality would also change in response to it. You shall be presented with a reality which is not there but your senses can perceive it. This can be referred to as virtual reality. This, a three-dimensional environment can be explored and made interactive. There are many ways to achieve VR. At Dynamic Pixels, we are eagerly working on the combination of images and sensory synchronicity to achieve the right sense of presence, where the subject can feel present in a virtual environment. Thanks to the possibility VR offers and our specialized team at work. We are as keen on novelty as our customer. 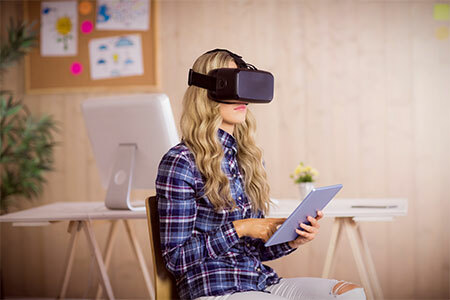 Contact us today to know how VR can be worked out to the best of your purpose.